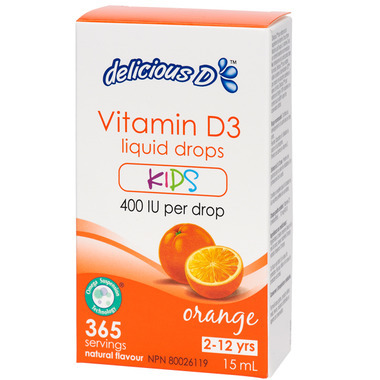 Delicious D is a natural, convenient and additive free way for adults, infants and kids to get their vitamin D3 in a deliciously, yummy flavour. Delcious D Vitamin D3 is suspended in medium chain triglycerides (MCT), a form of fatty acid derived from coconut oil that increases passive absorption of fat soluble nutrients such as vitamin D. MCT’s help to usher vitamin D directly into our portal blood stream for fast and effective results. Delicious D is also made using natural oils, which maximizes the absorption of the nutrients in your body for faster and more complete absorption. The UV rating must be above 3 for sunlight to be effective in producing vitamin D3 in our skin. Recommended Dosage: Children 2-12 years old: Take one drop daily. Non-Medicinal Ingredients: Medium chain triglycerides (form coconut), natural orange flavour derived from orange fruit essence. Favourite vitamin D! Give it to all four of my kids daily and find it last forever.